Hallways are one of the most travelled places in a home. Because of this, they also tend to become a central hub for discarded shoes, toys, clothes, school bags and other random accessories. It is essential to have a well decorated and presentable hallway, as one of the first impressions a guest has of your home comes from the state of your hallways. Make use of a couple basic entry decorating tips to create a more inviting atmosphere in your home. The simplest way to begin decorating your hallway is by adding a rug. When choosing a runner rug, get something smaller than the depth and length of your hallway. This will ensure that your hallway frames the rug properly. Hallway rugs are not meant to be used as carpets; their purpose is to highlight the area they occupy. Choose any style, design and color that complement the surroundings. 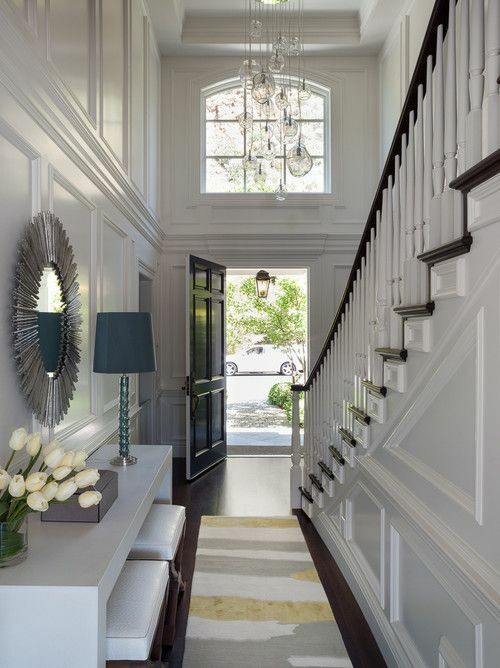 If you have a dark hallway, try adding some light-colored trim and molding from your local home improvement store. Hallways often have a dark color trim that make them appear too shadowed. Lighting fixtures are an integral part of your hallway decor. By adding wall scones, you will take your hallway staging to a whole new level. Place them appropriate locations to achieve the lighting effect you want. It is recommended to place wall scones five feet above the floor with ten feet separating each scone. If your house has high or vaulted ceilings, you should place them appropriate to the height of their surroundings. Hallway scones come in several different styles. These include contemporary types, made of wrought iron, antique, and mission style lights. Creating a framed wall collage of black and white photos of your family members is a creative way to create a personalize hallway decor. These are a few simple steps that you can take to immediately enhance your hallway at home. Don’t limit yourself to any specific format. Get creative! A Christmas tree adds magic to your home during the holidays, as it glitters and glows decorated with lights and ornaments. What is welcomed decor during Christmas, however, can quickly become a burden afterward if you don’t know how to dispose of the tree. Use as firewood. Cut the branches and use them as logs and kindling for your fireplace. It will save you money on buying fire wood and is also an eco-friendly option because none of the tree goes to waste. Use as plant coverings for your garden. Cut the branches off your tree and place them over your garden areas. They will protect the ground from becoming as cold by insulating it, which will improve the quality of your plans when they return in the spring. Use for barriers against soil erosion. Cut and arrange the tree branches in areas that are prone to erosion. This is an especially great option if you live along a river or lake or if you have a pond or sizable drainage ditches on your property. Use as mulch. Chop up your tree, have it shredded, and use the wood chips to mulch your garden. This can save you a lot of money on landscaping because mulch can be expensive. Use for crafting materials. Slice the trunk of the tree and use the pieces of wood as canvases for artwork or natural decorative elements in your home. Deliver to a recycling center. If you don’t know how to recycle your Christmas tree, then let others do it for you. 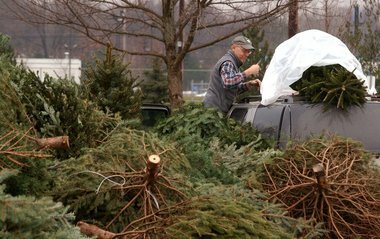 Most cities have recycling centers for Christmas trees after the holidays or special curbside pickup options.